Welcome to the walkers city. Getting around Madrid is alot simpler than similar sized cities with traditional extra wide boardwalks. Furthermore the excellent clean and on-time public transport makes sightseeing from one of the many city buses a real possibility! The ever expanding Madrid Metro/Subway/Underground system (depending on your particular origin), is a cheap and flexible way to move quickly between the many different city attractions. Open 365 days a year from 0600 to 0200 you can effectively have an evening meal and drinks before returning on the Metro. Madrid has an excellent network of bus routes serving it and its regions. Intercity& International links are maintained with modern coaches departing from the same stations. With the same cheap pricing system as the metro this provides a great way to see the city when its not too hot (Mid June to Early Sept). Safe 24hr Buses mean that even the nightowls amongst you are catered for! Buses are of course subject to the Madrid traffic conditions....which means use the morning rush hour as time for a late breakfast!! Cheap, clean and serving those destinations up to 100kms away as well as criss crossing the city of Madrid itself the Madrid Cercanias is a tourists saviour! Does anyone ever have anything good to say about taxi drivers? One of lifes necessary evils I guess. Thankfully in Madrid the taxis are registered to the city and must display fares as well as surcharges. Generally very easy to use and certainly available at every hour of the day. Check out our fare guide for typical prices. Whilst moving around Madrid is both simple and cheap with Public transport there is a possible need for a hire car if you are considering some of the excursions away from the city. With rates starting at less than 10€ a day if you are more then two people a rental car can save you money as well as allowing you to govern the stops along the route! 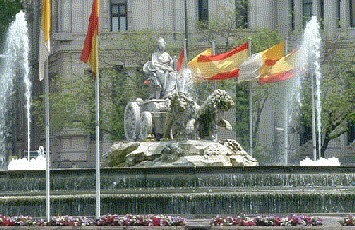 SO now you know all about getting around Madrid... Time to check out some of the attractions!